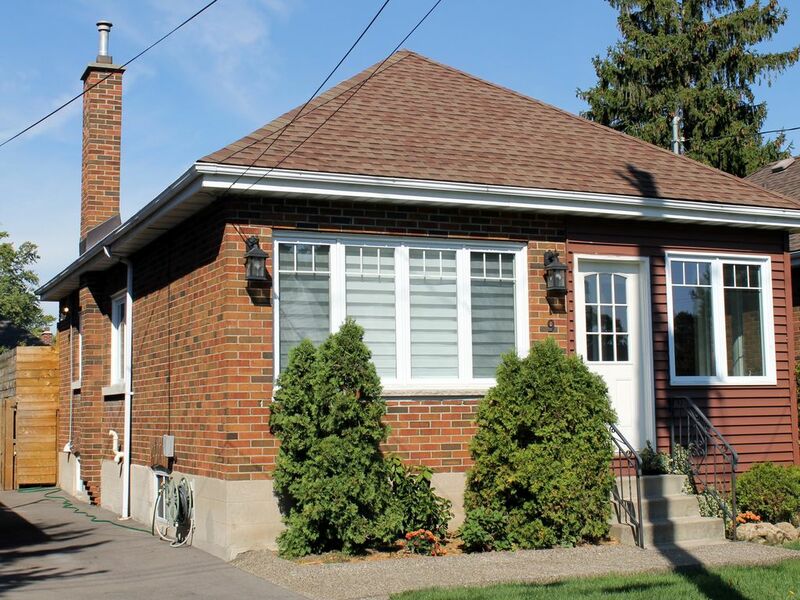 This three bedroom bungalow has four beds and is located in a residential area of Westdale, part of Hamilton West, this home sleeps 6 guests. Bedrooms include two queens upstairs and two twins (or a king) downstairs. Two full bathrooms, new kitchen, spacious back deck and enclosed backyard. Everything is included; parking, laundry, wi-fi, cable/smart tv, A/C, linens and towels. Walk to downtown Westdale and jump on a bus downtown or to McMaster University. SoBi bike rentals are just blocks away. Walk down the street to Valentino's Restaurant or to Food Basics Grocery Store. If this house is booked or if you want to read more reviews about our top-rated service, please check out our other VRBO listing in Dundas, VRBO # 717471. Please note we have a strict no parties rule and we ask you respect the neighbours by keeping the outdoor noise quiet after ten pm. We are a cycling family with three adult children and we love this area. We have lived here for 25 years and love to share our passion for Hamilton and area with our guests. We love the ArtCrawls, SuperCrawl, the many hiking trails and waterfalls, the waterfront, and the many awesome cycling trails and roads. When we travel we stay in VRBO homes, and we know what works, so we make sure our rental home has everything you need. We are responsive when you need us, but give you your privacy as well. We fell in love with this cute house because it is perfectly set up for short stays. It is open and light and tastefully decorated. It also happens to be around the corner from our home, so we can maintain it well and respond to your requests immediately. We loved the seating area on the back deck and of course the neighbourhood is the best in the city! Open concept, excellent heat and AC, walk or bike or bus to everything. We love the closeness to the bayfront trail where you can walk, rollerblade or bike along the waterfront, and we love to hike the Royal Botonical Gardens trails, which begin a few blocks away.l Spacious lower level provides a great family room for a second seating area and another TV viewing area. The upstairs bathroom is newly tiled and renovated, and the downstairs bathroom features a new walk in shower. A short walk into Westdale Village, which is part of Hamilton. Featuring an old fashioned movie theater, numerous restaurants and coffee shops, a raw eatery, and quaint shops, there is much to see. Central Air keeps the whole house comfortable. We also provide an indoor drying rack and outdoor clotheslines. We provide coffee, coffee filters, teas, sugar, spices, salt and pepper, oil, condiments, the basics. . You will find plenty of paper towels, napkins, tissues and toilet paper for your short stay. Everything is in this kitchen for your family meals. Fridge, stove, microwave, dishwasher, coffee maker, kettle, pots and pans, cutlery and lots of plates, bowls, cups, etc... Every detail! blueray connected speaker, also has a cord to plug your phone into. This is all on the smart TV. You can watch your movies on your NetFlix account or use the Bell Pay per view option. A few indoor and outdoor items. The back yard is fully fenced in. SoBi bikes are only a couple blocks away. You can register as a one time user or set up an account. Coronation Pool is about four blocks away and open in Summer. Dalewood Recreation Center is open year round with a newly renovated indoor pool. This is your perfect getaway home if you are planning visits to Toronto and Niagara Falls - we are less than an hour from each. If you are coming to work in Hamilton, you will be happy to be in one of the best neighbourhoods. This area offers the best of both worlds with access to all the amenities you could need while still having a small-town family atmosphere. Just a short walk from McMaster University/Hospital and just a few blocks from the Westdale shopping district with its boutiques, restaurants, coffee shops, public library and traditional movie theater. And just down the road is the Royal Botonical Gardens with miles of conservation walking trails, the Children's Teaching Garden, Friends of the Aviary, soccer fields, baseball pitches, cricket pitches and even a fantastic kids' play area with a new splash pad. A great place to stay, quiet neighborhood but fast easy to get to off the highway. Public bikes available, groceries and restaurants close by. Everything was clean and ready for us when we arrived and we were able to clean up and settle in with no fuss. All the little needful things were ready for us right out of the car including coffee, Band-Aids and olive oil. First class accommodation for weary travels. Just superb. Thanks Chantelle, and you will be most welcome to stay on your next trip! Very clean and comfortable, everything a three generation family visit needed. Close proximity to all services. Situated in a quiet neighborhood. Owner is committed to making stay as pleasant as possible! Highly recommended and would return! We are thrilled with our stay in this immaculate and cozy house that has quickly come to feel like home. We need a place to call home during the renovation of our house and this house has fit the bill perfectly. We love the neighbourhood immensely with easy access to walking trails, Princess Point, tons of shops and great restaurants. And, we can't say enough about how easy Bettie and Rob have made it for us with a fully furnished house, kitchen stocked with all the amenities, lovely cozy decor, and amazing linens in every room. They are so responsive to our needs, we feel so cared for! I am truly grateful to have this gem of a home for my family and I during this time of renovation. When everything else get stressful, coming home to our rental feels so easy, relaxed and peaceful. Thanks Maria, It is such a pleasure to know that our efforts have made you feel at home! We hope that your stay continues to be restful during your home renovation. I rented this house for my family (7 people) to stay while they were visiting me in the area. What a great option! The house is cozy, comfortable, and very clean. My family really appreciated how well set up everything was: a fully equipped kitchen, morning necessities like coffee, tea, and cream, 2 TVs with Netflix. Even umbrellas in the front hallway, which they put to good use! I'll use it again when we have a gang visiting. Thanks Katie! It was a pleasure having your family stay in the house and they are most welcome back anytime! Ruim huis, met ruime tuin, van vele extra's voorzien. Alles pas gerenoveerd. Dichtbij snelweg en centrum. Goede uitvalsbasis om Toronto en Niagara Falls te bezoeken. Maar ook om te gaan wandelen in Dundas Valley. Gastvrouw Bettie zowel vóór als tijdens ons verblijf erg behulpzaam. Walk a few blocks to the outdoor pool at Coronation Arena. In the winter enjoy family skate time at the same arena. The waterfront trail begins a few blocks away and provides an awesome paved pathway for walking, rollerblading or cycling along the Bay. This house is very close to McMaster University and its teaching hospital. Only a 45 minute drive to Toronto or to Niagara Falls. If you would like us to add linens for additional guests, we would be pleased to do so. You can choose to use the sofabed or use a twin foam mattress on the floor in the basement family room. Cost is $40 per night per extra guest beyond six.